The spacious apartment sleeps 7 people in two double rooms and one triple room. There is a large dining table, a well equipped kitchen with a hob, oven and microwave. The apartment is situated on the 1st floor with lift access from the parking garage. There is basement which houses the ski lockers. In winter the 860km of prepared slopes with 270 modern lifts is a skier and snowboarders dream. The ski bus stops 15m from the door and it is possible to walk to the ‘Grafenberg’ gondola which is approx 500m. The 'Flying Mozart' gondola is a similar distance but uphill and easily reached by the bus which stops outside the apartment. Both have good car parking and the two mountain peaks are linked by the new G-Link cable car, which gets you quickly between the two, with no need for cars or buses. There are 2 ski schools in the village, both of which offer excellent tuition for groups and individuals. Skiing: The Austrian ski resort of Wagrain is part of the Salzburger Sportwelt Ski Area with access to 138 individual pistes. In addition to the skiing in Wagrain itself (350km of piste ski runs), the appropriate ski Lift Pass will allow you to ski or snowboard in the other Salzburger Sportwelt ski resorts of Altenmarkt, Filzmoos, Flachau, Goldegg, Kleinarl, Radstadt, St. Johann-Alpendorf and Zauchensee. All of these are served by the local free ski bus service. The area is accessible to all levels of skiers; for those just starting out through to the expert. With skiing above 2000 metres, snow cover is generally reliable. Snow making - Wagrain is able to augment natural snow through the use of 60 Snow Cannons. Ski Lift Capacity :- The 100 Ski Lifts of Wagrain are able to uplift 22,977 skiers per hour. Resort altitude 850m. In summer Wagrain has over 140km of marked hiking and walking paths and clearly marked mountain bike trails for exploring the surrounding mountains. Summer Skiing is also possible on the nearby glaciers. Wasserwelt, a large water park, is 700m and walkable with good parking provided. Travel: Salzburg Airport is just one hours drive away. There are three airports within 3 hours drive, Munich, Graz and Innsbruck all served by low cost airlines. There is a Wagrain website which gives full details of winter and summer activities. Salzburg is the closest airport, less than 1 hours drive from Wagrain. There is a train service from Salzburg to St Johann im Pongau, which is 9km from Wagrain and served by bus or taxi. A car is not essential, but useful if you want to explore the surrounding area. The apartment is in the centre of Wagrain opposite the market square. There are 3 supermarkets within walking distance of the apartment. Further Details: There is a large walled balcony to 2 sides of the apartment with garden furniture. There is a good selection of restaurants, cafes and shops. There is a bank opposite with a cash point and next door to the bank is the tourist information office. There is a fantastic water park with indoor and outdoor pools, water slides, spa and sauna facilities approx 10 min walk from the apartment. We bought this apartment from new, 7 years ago and still love our trips out to what has become a 'second home'. We are happy to share this with you and hope that you and your family enjoy the beautiful area and all it has to offer in both summer and winter. 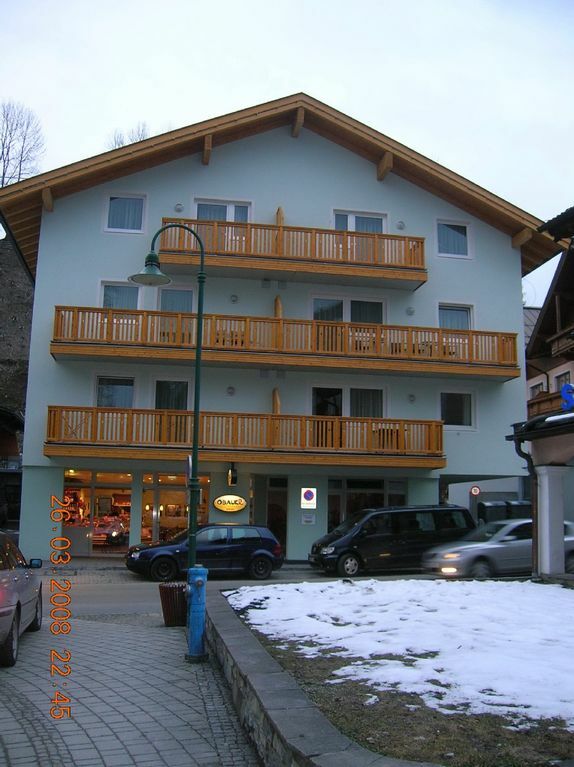 It is in a great and highly convenient location - with fantastic hassle free skiing and access to a vast ski area. The central village location gives easy access to shops, restaurants, bars and the ski lifts, with the ski bus stopping right outside the door. Also, beautiful in the summer months. Very large and spacious apartment with 3 en-suite bedrooms and a separate toilet off the living area. 3 en suites all have mirrors over the basin, with a wall light and a shaver point. Tiled floors and raised shower cubicles with glass door. The apartment has under floor heating with thermostats in each room. Suitable for families and has lift access to the door direct from the parking garage. There is a coin operated washing machine and tumble dryer in the basement, adjacent to the wellness area and secure ski and boot locker. It was a great choice of stay for Wagrain - great location, highly maintained facility, suited our needs completely! Perfect summertime retreat for families! 6 days wasn't long enough! The apartment is comfortable, very clean, and spacious and the owners are gracious and helpful. It fit our family of 8 with room to spare! My kids loved the huge movie library and the games.The location was perfect for families on holiday. There are endless things to do: hikes, mountaintop playgrounds, museums, beautiful lakes to swim in, alpine slides all set in the green alps of Austria. We've been traveling around Europe for two months and hands down, the apartment and stay in Wagrain have been our favorite part of our trip! After skiing elsewhere in Austria in 2010 we first came across the jewel of Wagrain in 2013. We loved it so much we that had to come back again in 2015. With some knowledge of the area after our first visit, we searched online for a property that would have all of the right amenities for our two families and be close to the bus route and the ski lift. This property was everything we could have asked for. The three bedrooms allowed the two couples to stay in a room each with the three children sharing the third room. Each room had its own on-suite bathroom (shower) and there was ample space for all of us to rest in the lounge after a good day of skiing. The dining room table comfortably fitted the seven of us and the kitchen had all the appliances we could want. The apartment was spotless when we arrived and the welcome note and nibbles were a nice personal touch. The apartment was situated right next to the Wagrain market plaza and the bus stop to the local ski areas (all in very close proximity). Restaurants, grocery stores, bakeries and bars were no more than five minutes on foot. Our favourite eating spot was Bosek's Cafe within easy walking distance and we had many a meal there during our stay. The skiing was fantastic and there were more than enough open slopes (even with some of the lower slopes closed due to lower than expected snowfall). We loved the village, we loved the apartment and we loved the skiing and would recommend all three to both friends and family. Six of us stayed here recently, for all of us this was our first time skiing. The ski school was great, the apartment was fabulous in a wonderful location . People of Wagrain were friendly and helpful. The owners were really helpful - would not hesitate to stay in this apartment in Wagrain again. Great holiday in the snow! We were with 2 families, 4 adults and 4 childeren, in this appartment. We had a great time, lots off snow. The appartment was clean, everything you need is over there. Supermarket on walking distance. Skibus in front of the appartment and only one stop to the skilift. It is also a great skiarea, for starters, but also for the more advanced skiing. We hope to come back next year! The ski resort , lifts ,tuition and ski hire are all very close by, 5 Mins walk at most or a short free bus ride . Great delli's for breakfast or provisions on your door step and launguage is not a problem . Turn left from the appartment and drive for approx.. 10 mins for a nursery slop ideal for children and adults just starting out. Most ski lifts offer bike hire during summer months and we can not wait to return and try this out with our friends and relatives . Set in the Sportwelt Amade region, Wagrain offers a fantastic location for skiing, walking and sightseeing. Once home to Josef Mohr, Silent Night was written here. Shops in the village range from top of the range ski and sports shops, through to banks, deli's, bakers and one where the most fantastic wood carvings are made. The gondola is approx 500m from the apartment, so access is easy and the bars, restaurants and hotels offer a good range of 'Apres Ski' and are within walking distance. With skiing above 2000 metres, snow cover is generally reliable. Snowmaking - Wagrain is able to augment natural snow through the use of 60 Snow Cannons. The price is based on up to 7 guests. A 25% non refundable deposit is payable on booking to secure the property. The balance is to be paid in full 60 days before the arrival date. 30% discount for late bookings within 4 weeks of arrival. €100 cleaning is additional and must be paid locally on arrival unless added to initial payment.